Normally, an artist does all the 3D modelling, then all the texturing, looks at their awesome looking model in the 3D DCC and says “looks fantastic, ready for integration!” then goes into the game, lighting is setup and the game runs. So at what point does all this HDR business come into play? The idea is that instead of dealing with colors that go from black to white (0 to 1), we use colors whiter than white (for example, 0 to 8 times white). To be more practical, imagine that in a regular scene, the intensity of a light (generally 1.0) is set to 5.0. The whole scene will turn very bright (towards white) and look horrible. Additionally, it is possible to set a threshold value to send to the glow buffer depending on the pixel luminance. This allows for more realistic light bleeding effects in the scene. The problem with this technique is that computer monitors apply a gamma curve to adapt better to the way the human eye sees. 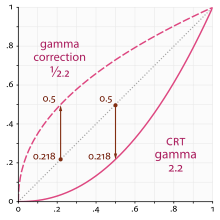 Artists create their art on the screen too, so their art has an implicit gamma curve applied to it. The color space where images created on computer monitors exist is called “sRGB”. All visual content that people have on their computers or download from the internet (such as pictures, movies, etc.) is in this colorspace. The mathematics of HDR require that we multiply the scene by different values to adjust the luminance and exposure to different light ranges, and this curve gets in the way, as we need colors in linear space for this. This is the most compatible way of using linear-space assets, and it will work everywhere, including all mobile devices. The main issue with this is loss of quality, as sRGB exists to avoid this same problem. Using 8 bits per channel to represent linear colors is inefficient from the point of view of the human eye. These textures might later be compressed too, which makes the problem worse. In any case, though, this is the easy solution that works everywhere. This is the most correct way to use assets in linear-space, as the texture sampler on the GPU will do the conversion after reading the texel using floating point. This works fine on PC and consoles, but most mobile devices do no support it, or do not support it on compressed texture format (iOS for example). After all the rendering is done, the linear-space rendered image must be converted back to sRGB. To do this, simply enable sRGB conversion in the current Environment (more on that below). Keep in mind that sRGB -> Linear and Linear -> sRGB conversions must always be both enabled. Failing to enable one of them will result in horrible visuals suitable only for avant-garde experimental indie games. Linear: Simplest tonemapper. It does its job for adjusting scene brightness, but if the differences in light are too big, it will cause colors to be too saturated. Log: Similar to linear but not as extreme. ReinhardtAutoWhite: Same as above, but uses the max scene luminance to adjust the white value. The same exposure parameter as in real cameras. Controls how much light enters the camera. Higher values will result in a brighter scene, and lower values will result in a darker scene. Determines above which value (from 0 to 1 after the scene is tonemapped) light will start bleeding. Determines how much light will bleed. Lower bound value of light for the scene at which the tonemapper stops working. This allows dark scenes to remain dark. Upper bound value of light for the scene at which the tonemapper stops working. This allows bright scenes to remain saturated. Auto-exposure will change slowly and will take a while to adjust (like in real cameras). Bigger values mean faster adjustment.